For colleges and universities this is the new age of accreditation, assessment, and self-study, and all of these administrative activities are having a profound effect on the teaching environment. Gone are the good old days when anyone who worked in the profession, or had a particular skill set, or even a proven track record as a successful illustrator, would be invited to teach. These days, due to accreditation standards, economically driven assessment requirements, and institutional policies, anyone teaching a class must also have documented credentials such as a specific degree and/or special certifications. Although this has long been a standard for tenured and full-time educators, these rigorous requirements have not been strictly enforced for adjunct and part-time teachers…until now. And, although not discussed here this is occuring in primary and secondary education as well. If you are an illustrator thinking of applying for a teaching position, there is information that can be very helpful in making the decision to try to enter the classroom that most adjuncts, part-timers, and even full-time faculty may not be aware of. The US Government subsidizes nearly every educational institution in the US in some part. 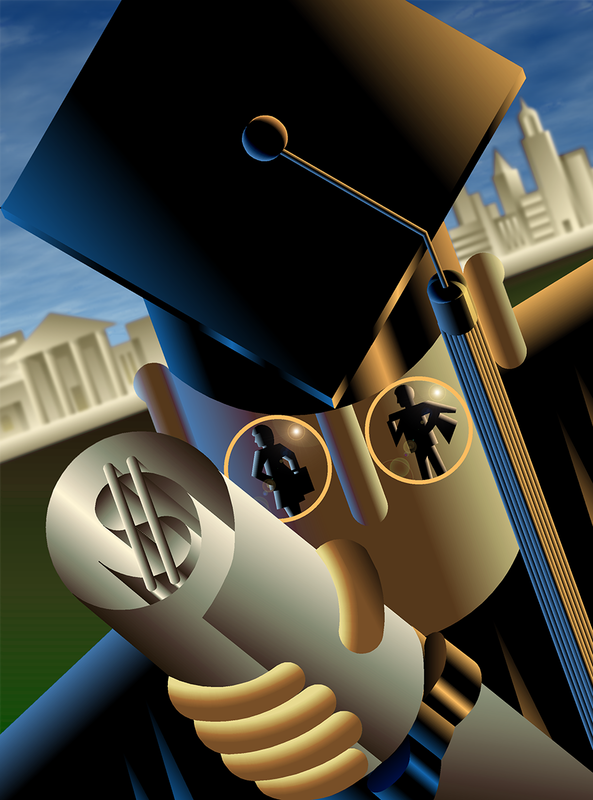 Other institutions and foundations also subsidize colleges and universities. Because of this schools must be accountable for how they conduct themselves and how these funds are used. Enter the accreditation organizations. These organizations are the watchdogs hired by the government to monitor the activities and performance of educational institutions for The US Department of Education and others. “The US Secretary of Education recognizes accrediting agencies to ensure that these agencies are, for the purposes of the Higher Education Act of 1965, as amended (HEA), or for other Federal purposes, reliable authorities regarding the quality of education or training offered by the institutions or programs they accredit.” The accreditation reports generated also inform foundations and benefactors as well, e.g., The National Science Foundation (NSF), The National Endowment for the Arts (NEA), The Andrew W. Mellon Foundation, etc. Nearly every category in education has an accreditation body, from the arts and humanities, to engineering and architecture, even to teaching and educational practice. There are hundreds of accreditation organizations. The College of Imaging Arts and Sciences at RIT, where I teach, is accredited by the National Association of Schools of Art and Design Commission on Accreditation (NASAD) and the Middle States Commission on Higher Education (MSCHE). The National Association of Schools of Art and Design, Commission on Accreditation accredits freestanding institutions and units offering art/design and art/design-related programs (both degree- and non-degree-granting), including those offered via distance education throughout the United States. NASAD is the only accreditation organization focused specifically on art and design programs. Like many other regional accreditation bodies, and there are many, most accreditation organizations like the Middle States Commission on Higher Education monitor all programs within a college or university. NASAD has established a number of standards for measuring the accountability art and design education from the quality of student life to classroom environment to curriculum delivery. Along with NASAD, most regional accrediting organizations subscribe to the above standards and apply them across all disciplines. There are many measures, too many to list. Here are three key standards that have an effect on teaching illustration. 1. You must already have attained the degree level of the students you are teaching, This means you can teach BFA, BA, or BS students if you have a Bachelor’s Degree, but you cannot teach MFA, MA, or MS students. For that you would need to have a Master’s Degree. Bachelor’s candidates cannot teach other bachelor’s candidates, and likewise for master’s candidates. Also, a person with an Associate’s Degree cannot teach bachelor’s students. 2. There must be a written curriculum for the course you are teaching whether it is written by you or not. NASAD does require syllabi to be available for review, and they do look at how the content of your syllabus coordinates with other courses in the degree program, such as how the content satisfies as a pre-requisite to higher-level courses. Most schools can provide you with a course outline with goals and objectives, which can help you to develop your assignments. You should also seek out other faculty in the degree program to find out what they are doing. 3. There must be a method of assessment for your course. The school where you teach may provide this for you. You can also develop your own method. Today colleges and universities assess course outcomes and student performance well as your own teaching performance. Schools are using comprehensive strategies that consist of drill down assessment to the program level and even to individual courses. One aspect to NASAD, which differs from regional accreditation organizations, is that NASAD actually views and judges the quality of student work. For this reason it is important to document the work your students produced in your class to provide evidence of your successes. When you are engaged as a teacher you will be given a title or rank. Each rank has it’s own set of job responsibilities and expectations. Professors, associate professors, and assistant professors comprise this body of faculty. They are full-time employees who receive full benefits, i.e., health and life insurance, and retirement benefits. Tenure/tenure track faculty are required to teach, conduct research/scholarship, and provide service. Visiting artists, artists in residence, senior lecturers, lecturers, and instructors make up the non-tenure track faculty at colleges and universities. They have full-time status and may receive full or partial benefits. Non-tenure/tenure track faculty are required to teach and provide service. Visiting artists and instructors who either who do not teach full-time, or only teach for a limited length of time. With their part-time status and may receive partial benefits or no benefits. Part-time faculty are required to teach and possibly provide service. Part-time instructors who are usually limited in the number of courses they can teach in a school year. It is the norm for adjuncts not to receive benefits. Adjunct faculty are usually required only to teach. Do your research. Know the academic environment you are joining. Seek advice when in doubt about policies, procedures, and dealing with the students in your program. Familiarize yourself with the Human Resources Department and employment requirements. Follow college guidelines. Consult the administrators of the program you teach in, such as the Program Chair and Administrative Chairs when you have questions. They have the answers, can help, and are willing to make your academic life easier. While being an illustrator is a solo activity, teaching is a team endeavor.